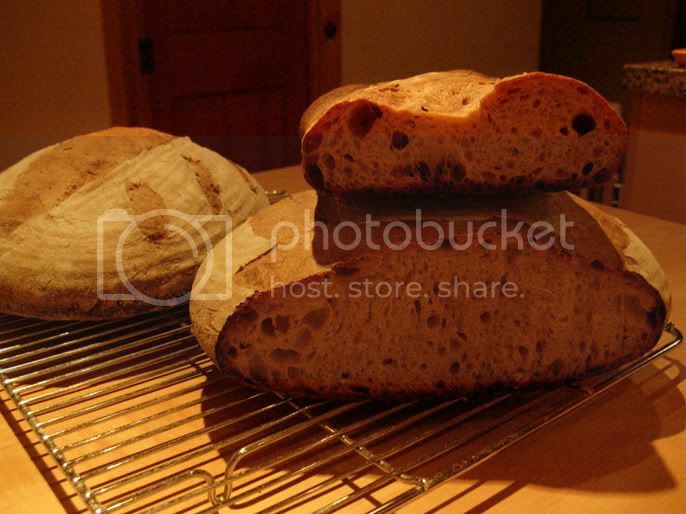 Does anyone know where to obtain high extraction wheat flour? I've made my own from flour I've milled myself, and it's too much work with the rudimentary tools I have. So far, Google hasn't found me a source. Another question is Does anyone know of a bolting machine or other sifting device for making high extraction flour that is appropriate for home use? 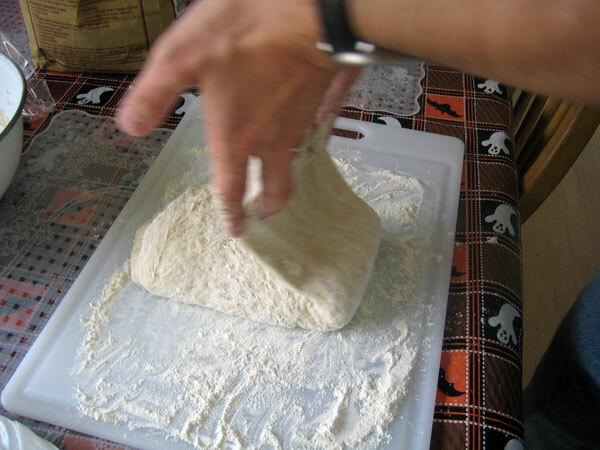 Yet another question is Does adding white flour to whole wheat produce a flour close enough to high extraction flour to make the search for the real thing unnecessary? Detmold 3-stage process as he describes here: http://samartha.net/SD/procedures/DM3/index.html he even has an online calculator! Pull starter out of fridge and warm up till active. 1) 2 Tbsp. active starter, 2 Tbsp. rye, 1.5 Tbsp. water; 80º-84ºF for 6 hr. 2) ¼ cup rye, 1.5 Tbsp. water; 70º-80º for 12-24 hr. Pull out 2 Tbsp. of #3 and reserve in fridge for next batch. Work up about five min in the KitchenAid, let rise till double (~1 hr @ 80-85º). Re-roll into a ball and rise till doubled again (~for 1 hr @ 75º). until the internal temp is 200-205º. At baking911.com there is a troubleshooting section. One of the problems listed is 'large holes.' I find it funny since everyone here, as far as I can tell, want large holes, or somewhat large. It says the problem is underkneading or over rising. The remedy is thorough kneading. Anyway, thought I'd share. Finally got around to building my "high dollar" proofing box. 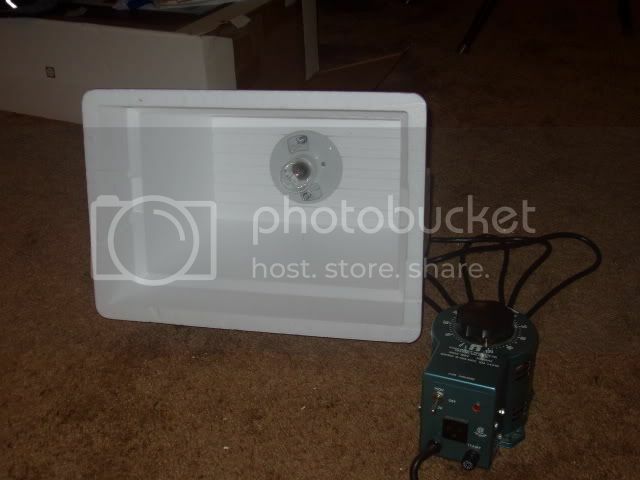 First picture is the inside of the box w/transformer to the side. Happened to have the transformer on hand from my day's as a research chemist. 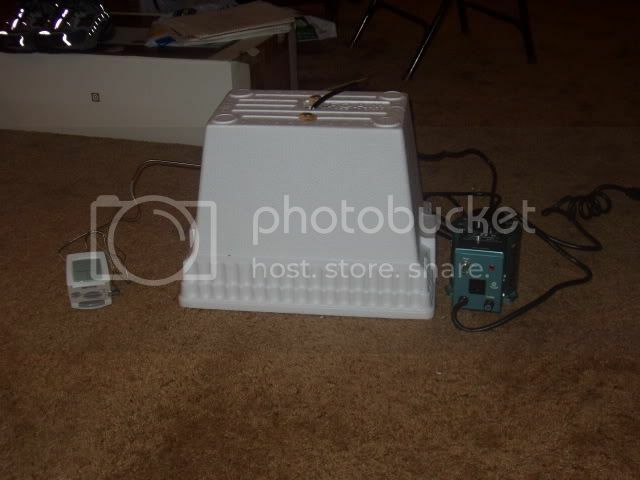 Second picture is the outside of the box showing the temperature probe and the transformer. 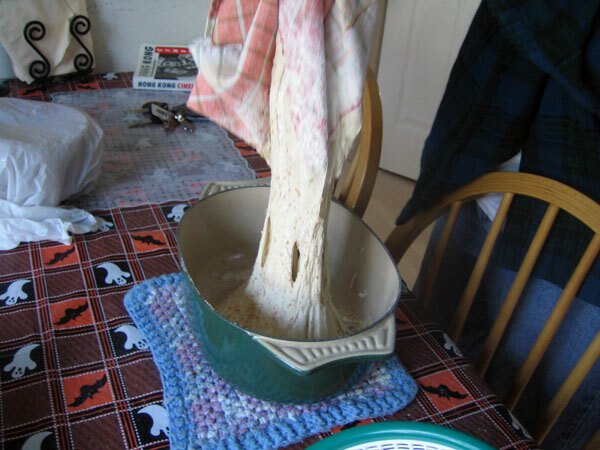 I was poking around eGullet this morning when I happened upon an excellent sourdough article that really helped things click into place for me, at least mentally. I'm going to be travelling for a bit and so won't get back to the kitchen for sometime. What Jim has been saying about time, temperature and the percentage of starter in a dough made sense to me, and has helped me improve my bread (thanks! ), but I still didn't understand a few things. For instance, I know that I've had a more sour bread when I retard it in the fridge, but I've also had a more sour bread when I increased the proofing temperature to about 82 degrees. Why is that? This graph from the article, I think, might help explain it. I realize now that it's a version of the graph that Jim posted, but at the time, I didn't realize that Candida Milleri in Jim's graph was yeast. The key factor, if I'm reading the article and Jim right, is not necessarily the level of activity, but rather the respective levels of activity between the yeast and the bacteria. 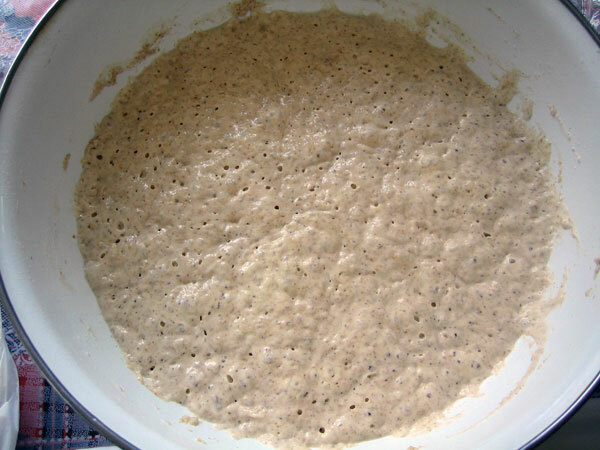 At room temperature (about 70-75 degrees F), for instance, the yeast and bacteria are roughly equal in activity. However, on the edges -- lower than 70 degrees and higher than 75, bacterial activity outpaces yeast activity. The right temperature is the single most critical variable. Michael Ganzle and his co-workers did some studies on this. They found the following growth rates of L. sanfranciscensis and C.milleri as function of temperature. Growth rate is ln2/generation time, i.e. 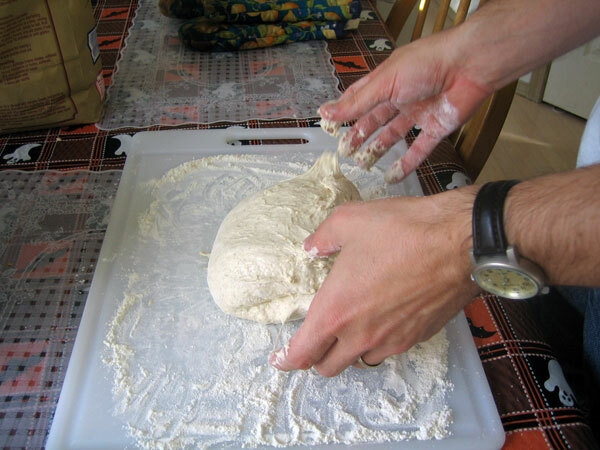 a growth rate of 0.7 is a generation (doubling time) of about 1 h.
There are a ton of other variables, of course -- the proportion of bacteria to yeasts in the starter, the species of yeasts and bacteria in the starter, etc -- but might this explain why both retarding the dough at a low temperaure and fermenting at a somewhat elevated temperature (~82-85 F) would produce a stronger sourdough than fermenting at room temperature -- because the bacteria are more active than the yeast? This is the Flax Seed Wheat Bread from Dan Lepard's The Handmade Loaf (a great book, but one not easy to find in the US). 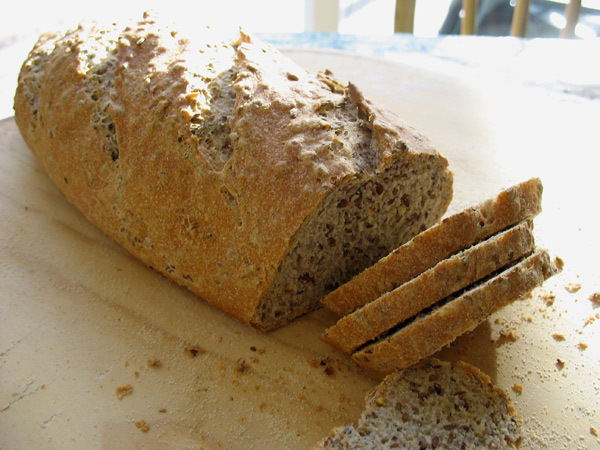 Recipe for the Flax Seed Wheat Bread here. For this past weekend's baking, I decided to make the Thom Leonard Country French bread (Glezer) again, but using my rye starter, and compare it to the Essential Columbia (also Glezer) my current favorite recipe. For the Columbias, however, I made two different batches for further taste comparison: one with a wet rye starter (saving the step of making a firm starter if you don't keep one) and the other with the firm white starter called for in the original recipe in Glezer's book. The crumb was beautiful as was the oven spring and crust. I also used King Arthur AP flour only, rather than a mix of AP and Bread, because the protein level of KA AP is as high as other bread flours (11.7%). The last time I made this bread using KA bread flour, the crumb was way too tough and chewy, even for me who likes chewy bread. Seems like the only reason to use a very high protein bread flour like KA (12.7%) would be to strenghten mostly whole grain breads. The Thom Leonard above tasted very nice for a mostly white French bread, however, I have developed a taste for a bit more whole wheat in my bread which is why I prefer the Columbia at the moment. Of course, the original Thom Leonard recipe calls for high extraction flour, not white AP flour. If I can ever get my hands on some, I will try it again with that. Despite the spread out loaf, I still got some nice holes and the crust was gorgeous! The taste was as great as before, with a slight flavor from the rye starter that made it taste mildly like a rye bread. 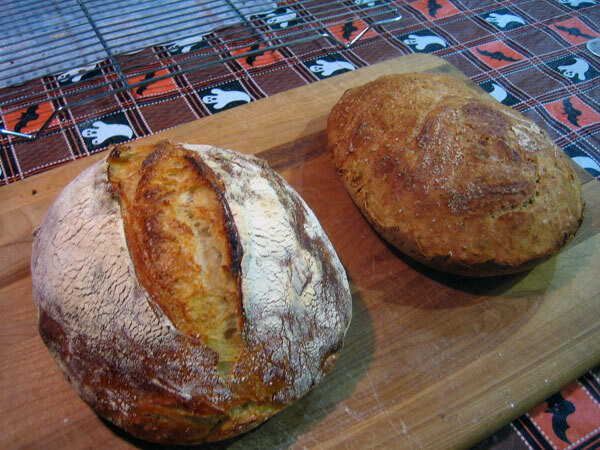 I also found that I prefer making the smaller batards free-form for this recipe rather than using a banneton to make larger boules. 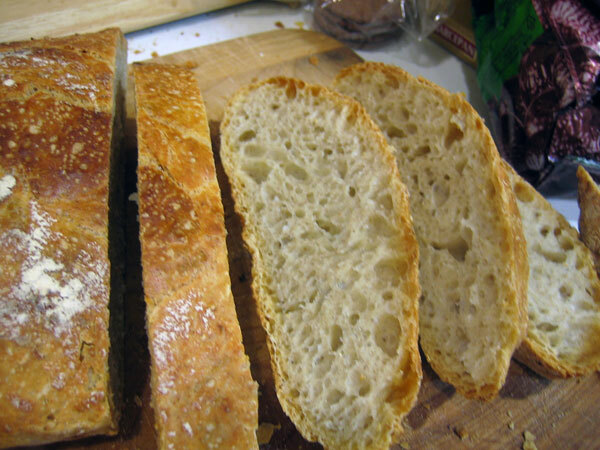 Not only does this avoid getting excess flour on the crust, but it provides a greater surface area and ratio of crust to crumb, since the crust is so good on this bread. As far as taste difference in crumb between the wet rye starter method vs. the stiff white starter, it is very hard to tell the difference, but I like the stiff starter version's flavor slightly better - it has a bit more tang and wheaty flavor and slightly less rye flavor - the rye flavor in the rye starter batch may outcompete the wheat germ and malt flavors. I would probably get the same result using my wet white starter, so I will try that next. 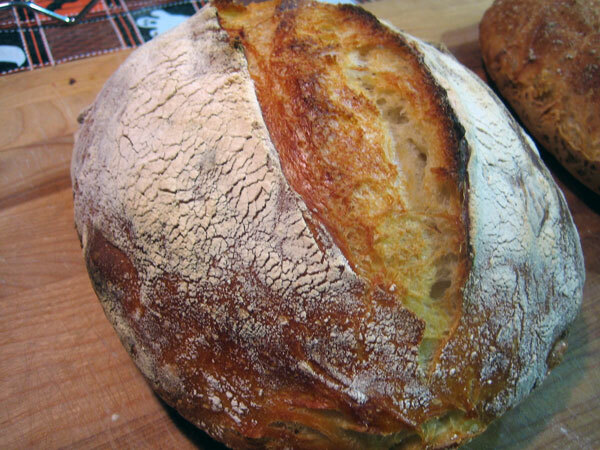 1) levain: using a wet starter seems to work just as well in this recipe as using a stiff one - the type of flour used will make a bigger difference in flavor than the hydration does. 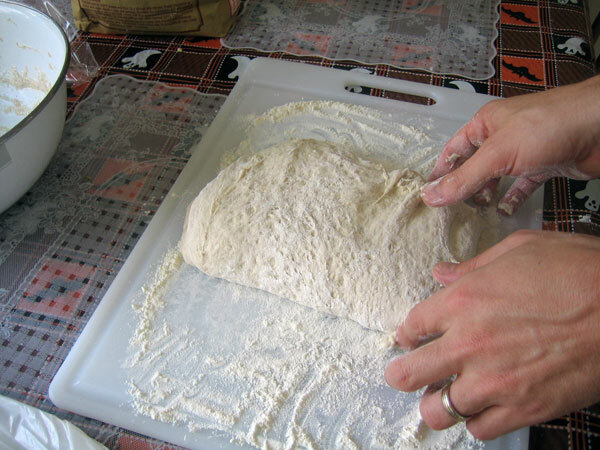 2) first fermentation: do not de-gas the dough completely, just fold it 2 or 3 times for strength during fermentation 30 min. apart. I also retarded the dough overnight in the fridge after a 2 hour room temp. first fermentation. 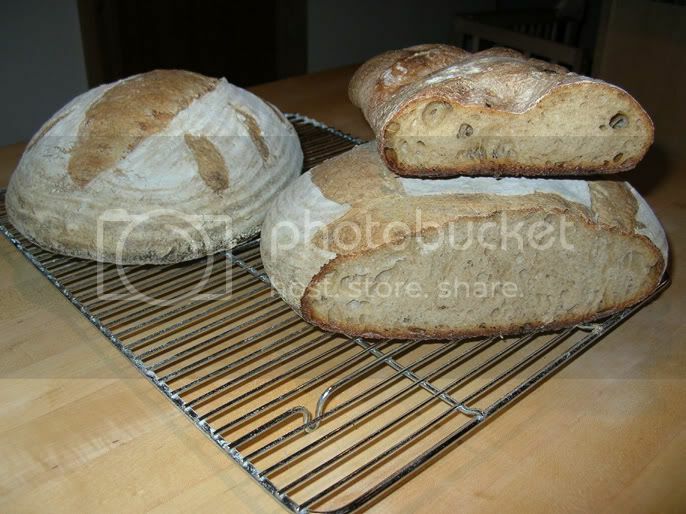 3) shaping and proofing: handle as little as possible without de-gassing as noted above, but do gently form smaller batards rather then large boules to get more crust ratio. 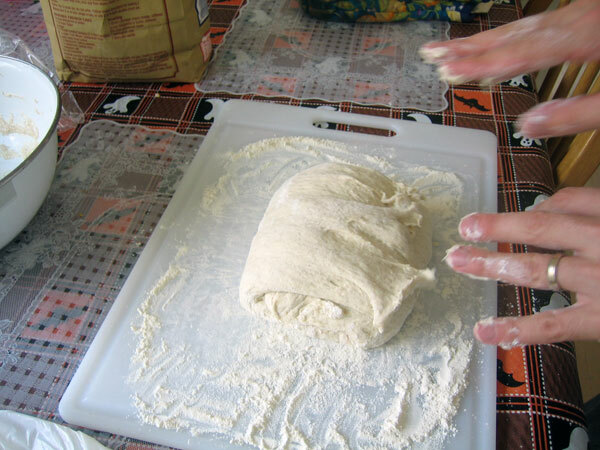 Without pressing out the gas, do tighten the batard into a very tight cylinder as much as possible to create enough surface tension to avoid it spreading out too much or flattening when scoring. 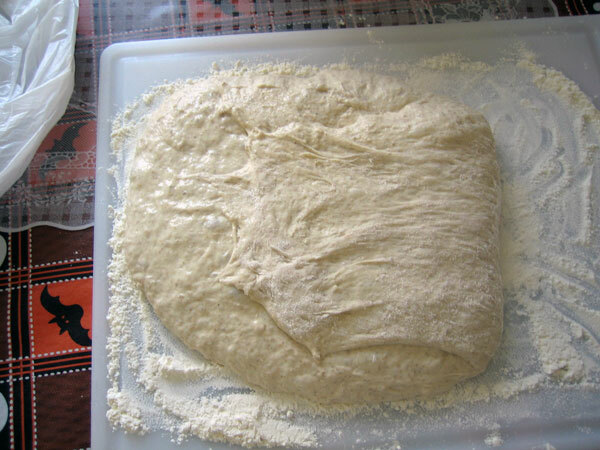 4) when slashing a slack dough like this, don't score over it again or it will flatten it out too much. 5) avoid over-flouring bannetons as it ruins the crust and didn't really help with the sticking anyhow, maybe a spray oil is better - I'd like to know how people avoid banneton stickiness and resulting collapse with the coiled willow baskets. I know how to slash my bread but my brand new razor blade still drags, pulls, bread. Right now a loaf is rising for 2nd time. 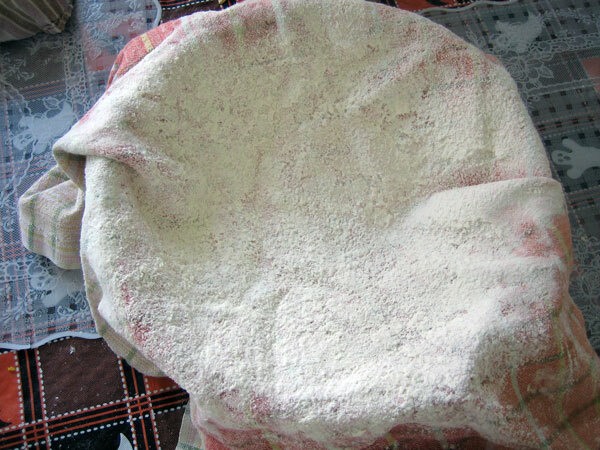 I smoothed on flour, then covered pans w dry kitchen towel. This way I should get a slight crust, so that my blade won't drag. But any other ideas?? Thanks. So I set out today to try the new technique that we've been discussing from the New York Times article. 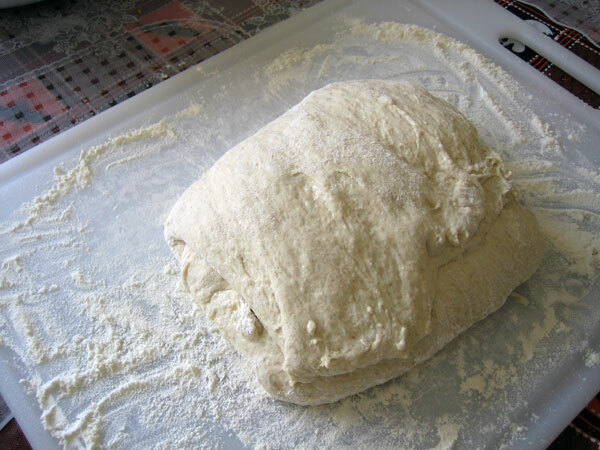 I created a dough like what he described the night before and gave it an 18 hour rise. 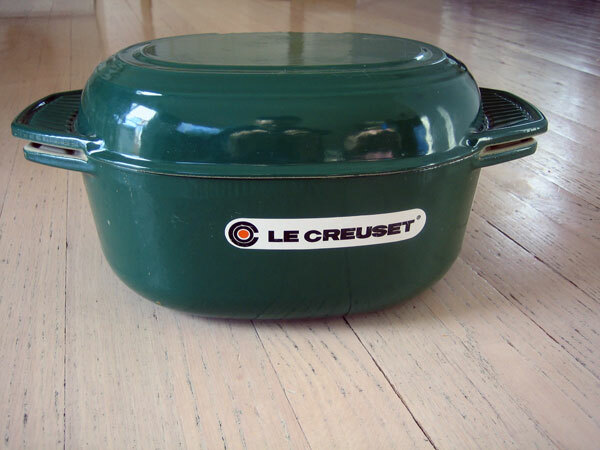 This morning, I dusted off a Le Creuset pot I got as a gift a few years ago but have rarely used. 18 hours later, the dough was extremely bubbly. Personally, I thought it smelled a little overfermented. Slightly alcoholic. Around 80% hydration, folding it was a pain. Despite flouring the bowl like crazy, it stuck. I baked it anyway. It came out ugly, but with pretty nice crumb. The pretty loaf was a sourdough I baked the same way (in the pot covered for 25 minutes, in the pot uncovered for about 20 or so at 450). It was a damp dough, but not *that* wet. More like 65-70% hydration. Much easier to handle. I may try it again, but I'm not overwhelmed by the results. They are good and it is a little simpler, technique-wise, but I enjoy a more traditional approach too.